The graphics in the article are copyrighted by this site, and aren't for any other use without permission. Feel free to use them as a guideline in your search, though. Their site has lots of good photo's of original and modern interperetations, with a great links page as well. there are no pistols while the hussar appears to be around 1670s - and pistols were adopted as early as 1577 and became widespread in 1590s. the stirrups are too narrow and lack several other characteristics of the so called hussar stirrup. there is no throatlatch on the bridle. 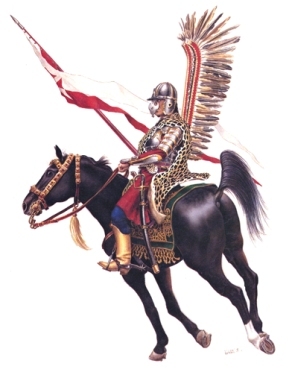 the color of the horse is black - well, according to several Polish horse magnagement books form the 16th and 17th centuries color black for a military horse was not a wise choice (they called 'black' horse a crow or raven - depending on the shade of black - horse). Preferable colors were bay - all shades, then greys, whites, dun, buckskin, roans and chestnuts (they called them yew/ taxus color), appaloosa. his hooves are light - well, the 16-18th cneturies Polish horsmen did want horses only with black hooves. Perhaps there are more 'error; with the armor but one cannot tell because this small scale of the picture.